While it feels like we have been at this forever, a quick look at the calendar this weekend revealed that we still have about 15 weeks to go before our tentative job completion date. Tile should be here in a couple of weeks and the wood floors will begin going in this week. The cabinet maker is beginning the process of building the boxes for the kitchen and vanities. We are still in the weeds making decisions about cabinet fronts and door knobs and pulls. Let’s be honest. There is a whole lot of decision fatigue at this point in the process. And we have so so many more decisions to go. I was traveling last week while the contractors put the finishing touches on the drywall (mud, etc.). Truth be told, I haven’t been in the house is over a week so I have no idea what shape it is in. In my head, I’m singing Elsa’s anthem. We spent some time before I left making sure sconce wiring was in the right place and kitchen cabinet measurements were correct. 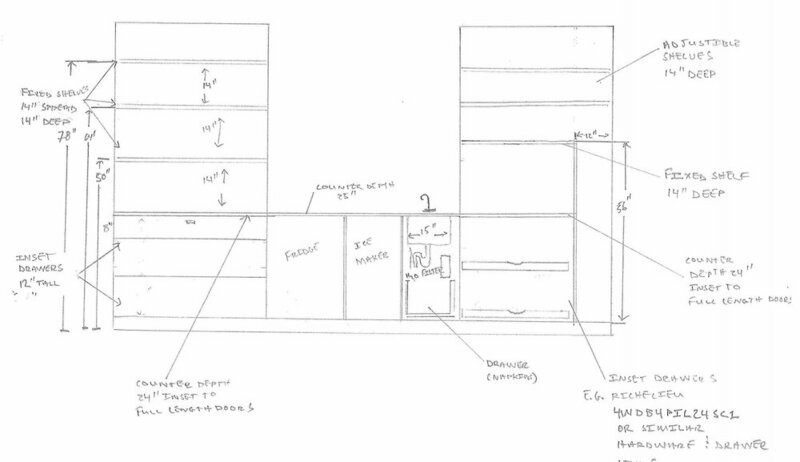 I drew up plans for all three bathroom vanities and my husband and I both worked on drawing up kitchen cabinet plans. Y’all. I know you are in your kitchen right now swearing at whoever planned your cabinets. I have been there. And you say things to your spouse like, “If I had planned this kitchen, we wouldn’t have to store cookie sheets in the closet.” I hear you. I have said these things too. But I am here to tell you as a decorator who does not specialize in kitchens that there is a very good reason kitchen planners exist. It is really hard to plan a kitchen from scratch. My family spends a lot of time in the kitchen. We know what we have and how we cook. 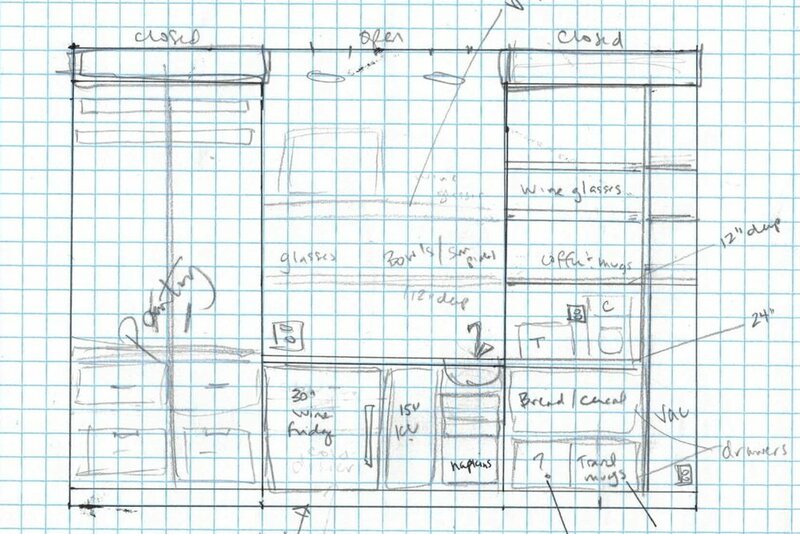 Kitchen planning has still been one of the most difficult parts of this whole renovation. How do I know where I’m going to want to put the cheese grater? And did anyone remember to carve out a space for the dog food? The best money we have spent so far, hands down, has been $60 at IKEA to spend 2 hours with a kitchen planner. I know all the kitchen designers are going to yell at me for disclosing that fact. And no lie, you should absolutely hire a kitchen designer if it is in your budget. It was unfortunately not in our budget. So we went to IKEA and got a start. The rest we worked through based on how we use our kitchen and what we know we have. It won’t be perfect (if you’ve learned nothing reading this series, it should be that there is no such thing as perfect in a remodel), but we are getting pretty excited about our kitchen. Perhaps the part I am most excited about is the pantry wall, which my husband is calling the bar and which I am calling the breakfast station. I guess we will see who wins that little battle once it is installed. We came up with a quick sketch a couple of months ago, which my husband kindly cleaned up and put some detail in last week. You are probably wondering which one of us is the designer. Evidently, my husband learned a lot while I attended design school. Maybe we can take over where Chip and Jo are leaving off. Anyway, back to the kitchen. The section above the "bar" will be tiled like the other side of the kitchen and will have open shelving for breakfast dishes (something like this or this). I'm a huge fan of all the funky glasses and colored bowls and mis-matched white plates, so those will live on the open shelving with easy kid-access for independent breakfast functionality. You feel me, parents. Make it easy for those kids to make their own breakfast. The toaster and coffee maker will live behind closed doors on that lovely fixed shelf to the right side. The pantry (left side) will be something like this. I'm kind of in love with these sconces but in midnight blue so, for now, that's what I'm seeing in this area. The amazing thing is that this is only the tip of the kitchen iceberg. I may even decide to cook again. But for now, I'll leave you with your own kitchen dreams. More to come as the cabinets progress.